FOREX: The US dollar index is marginally higher on Thursday, after posting some relatively small losses (-0.13%) in the previous session. 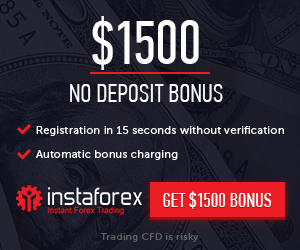 Meanwhile, the kiwi collapsed overnight, falling by nearly 1.4% against the dollar, after the RBNZ pushed further back the anticipated timing of its first planned rate increase and reiterated that a rate cut remains on the table. The British pound underperformed as well, touching fresh multi-month lows against its major peers as speculation for a no-deal Brexit remained front and center. STOCKS: US markets struggled on Wednesday, as attention turned back to trade tensions. While the Nasdaq Composite managed to advance a little (+0.09%), the S&P 500 closed practically flat (-0.03%) while the Dow Jones stumbled (-0.18%), with declines in energy stocks weighing. Walt Disney (-2.21%) fell after disappointing earnings, while Caterpillar (-1.88%) and Tesla (-2.43%) also underperformed. As for today, futures tracking the Dow, S&P, and Nasdaq 100 are all currently close to neutral territory, pointing to a flat open. Meanwhile, Asia was mixed on Thursday. Japan’s Nikkei 225 and Topix fell by 0.20% and 0.26% respectively, dragged by a stronger yen, while in Hong Kong the Hang Seng gained 1.18%. In Europe, all the major benchmarks were expected to open relatively flat today, futures suggest. COMMODITIES: Oil prices nosedived yesterday, after China announced the list of $16bn US products it will impose retaliatory tariffs on, which include crude oil. WTI dropped by an astounding 3.4% to touch $66.80 per barrel, and Brent by 3.2% to $72.25 a barrel. The losses were likely amplified by a smaller-than-projected drawdown in the official EIA crude inventories. Both WTI and Brent are higher today, albeit not significantly so. In precious metals, gold has entered its summer lull, trading in a very narrow range between $1,220 and $1,204 so far in August. A break in either direction could determine whether a short-term rebound is in store, or even further downside. The British pound was once again in the spotlight yesterday, dropping to its lowest level in almost a year against the dollar, and touching a fresh 10-month low against the euro earlier today, with euro/sterling breaking above the psychological 0.90 handle. Speculation that a no-deal Brexit is becoming increasingly more probable remains the name of the game, with investors rushing to decrease their exposure to the pound ahead of the next round of Brexit talks, scheduled for August 16. With the BoE also having adopted a cautious stance, the sources of support for sterling over the coming weeks are likely to be scarce. On the data front, the UK GDP data due tomorrow could provide some relief to the currency, but even in that case, any bounces in sterling may remain relatively limited until – and if – a Brexit accord is seen as being near its completion. Overnight, the kiwi collapsed, with kiwi/dollar falling by nearly 1.4% to touch a fresh two-and-a-half year low, following yet another dovish turn by the RBNZ. While the Reserve Bank kept its policy unchanged, as was widely expected, it pushed back the projected timing of its first rate hike to December 2020, from March 2020 previously. Officials highlighted tanking business confidence as a key risk, and reiterated that rates can move both up, or down. Overall, the RBNZ will likely maintain a defensive stance for a while still, which suggests that absent a material improvement in economic data or a de-escalation in trade tensions, the outlook for the kiwi remains bleak. On the trade front, China announced yesterday the list of $16bn US goods it will impose retaliatory tariffs on, which include crude oil, coal, and chemicals. The news sent oil prices tumbling, and also kept a lid on broader risk appetite, with US stock markets struggling. Meanwhile, the safe-haven Japanese yen shined bright, advancing against all its major counterparts amid jitters for further escalation. In politics, the diplomatic row between Canada and Saudi Arabia appeared to intensify further yesterday, with Saudi authorities reportedly instructing asset managers to sell Canadian assets. Nonetheless, the loonie managed to advance, following headlines that US and Mexican negotiators may reach a NAFTA cars deal this week, allowing Canada to rejoin the talks soon. Thursday’s calendar features producer price data out of the US. Meanwhile, trade developments remain front and center after China decided yesterday to retaliate to recent tariff actions by the US, while a US-Japan meeting on trade is also on the horizon later today. Canadian housing starts data for July are slated for release at 1215 GMT. US factory price data as gauged by the producer price index (PPI) will be hitting the markets at 1230 GMT. July’s PPI is anticipated to grow by 0.2% m/m, below June’s 0.3%. This would still allow the annual pace of growth to remain at 3.4%, which was the highest since late 2011. Similar to headline PPI, core PPI that excludes volatile food and energy items is projected to ease on a month-on-month but remain unchanged on a yearly basis. The numbers may be seen by markets as a precursor to tomorrow’s release on consumer prices. Thus, a data beat may support the dollar, stoking expectations for two more Fed rate increases as the year unfolds, and vice versa. 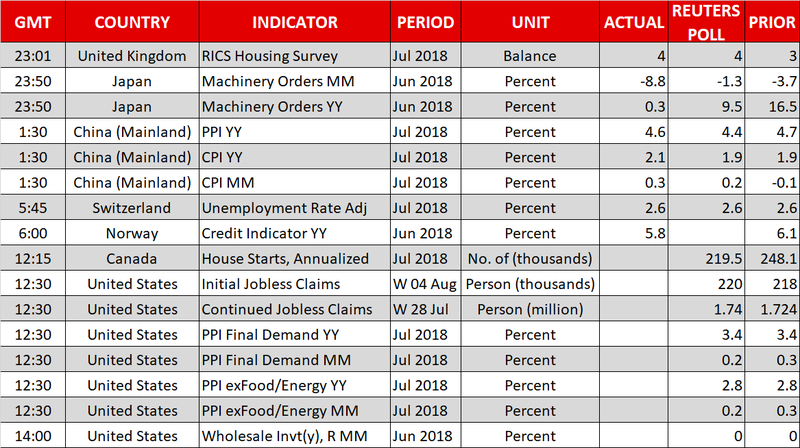 Additionally, weekly jobless claims figures are due out of the US at the same time, while data on June wholesale inventories will be made public at 1400 GMT. On trade, any updates will be closely watched after China said it will apply 25% duties on an additional $16 billion worth of imports from the US from August 23, matching the Trump administration’s latest tariff move. In the meantime, a meeting on trade between US President Donald Trump and Japanese PM Shinzo Abe later today in Washington will be gathering attention. Beyond bilateral considerations that would probably include how tariffs on automobiles will play out, the two sides may also attempt to forge an alliance against China on the trade front. US Trade Representative Lighthizer and Japan’s Economy Minister Motegi will also be meeting as part of the talks. 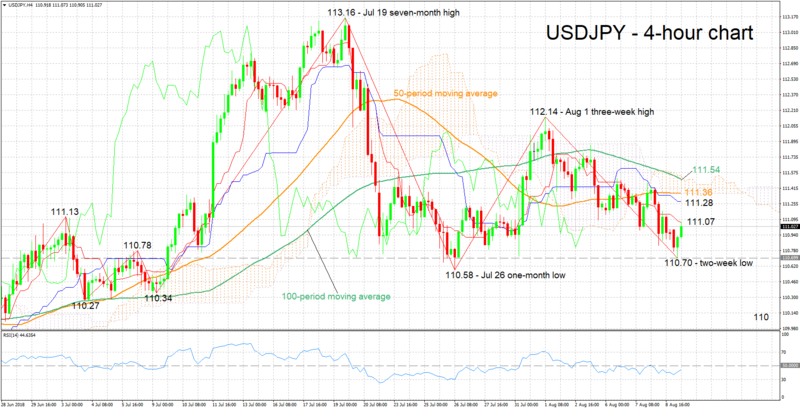 USDJPY has turned higher after hitting a two-week low of 110.70 earlier on Thursday. The Tenkan-sen is below the Kijun-sen is support of a negative market bias. The RSI is in bearish territory below 50, though notice that it has reversed higher, which may be an early indication of changing momentum (from negative to positive). 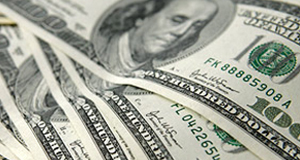 Stronger-than-forecasted PPI numbers out of the US may boost the pair. Given a decisive break above the Tenkan-sen at 111.07, resistance may come around the region spanning from 111.28 to 111.54 which includes the Kijun-sen, 50-period moving average line, 100-period MA and the Ichimoku cloud bottom and top. Conversely, a data miss could push USDJPY lower. Support in this instance could be met around the earlier hit two-week low of 110.70, with the one-month low of 110.58 from late July also being part of the area around the aforementioned trough. Further below, the 110 round figure would increasingly come into scope. The US-China trade spat, as well as the outcome of trade discussions between the leaders of the US and Japan, also have the capacity to move the pair.